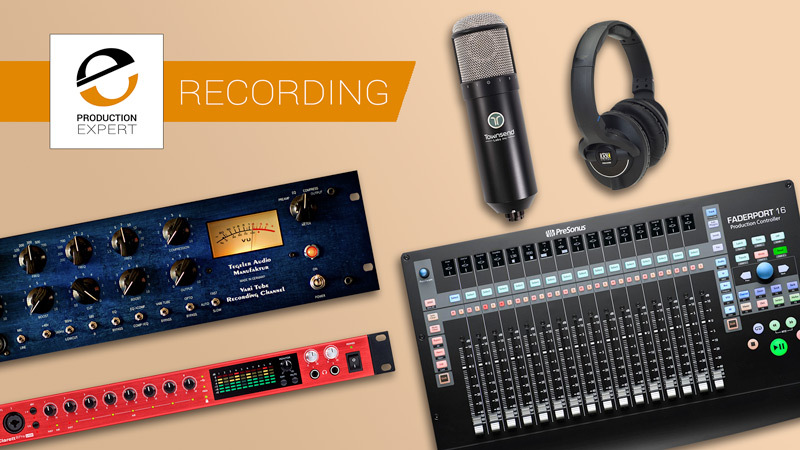 Production Expert | What Are Your Studio Gear Essentials For Recording? What Dan's Tracking Workflow Can't Live Without? What Are Your Studio Gear Essentials For Recording? What Dan's Tracking Workflow Can't Live Without? Over the years my recording studio gear collection has grown and grown. Every so often I look around my room in the mind of selling off some of my unused gear on eBay as I know deep down that the main purpose of studio gear isn’t just to sit in a corner of a creative space such as a studio collecting dust. Recently I have been selling off some unused gear and this got me thinking, what are my studio gear essentials? If I were to slim down my studio gear collection further what would I need to keep in order to still be able to get my recording work done? These products would be considered my studio gear essentials list. It’s a thinker for sure. Many years ago I did have a list of gear that I consider essential. This was at a time when my options were limited due to budget restraints, however, over the years I’ve been able to afford more gear, which has increased the amount of studio gear I own somewhat. In this article I take you on a quick virtual tour of my studio gear essentials for tracking and recording. I have purposely not included the studio computer or studio monitors in this essentials list as I want to focus on the more specific studio gear we use solely for the job of recording. For over a decade I have predominantly used a AKG C414 as my main multipurpose studio microphone. To my ears this microphone has always sounds amazing on just about anything I’ve thrown at it. It’s versatility as a multipurpose microphone lays in its variety of polar patterns, pad and high pass switches. The sonic characteristics of a C414 are also very easy to work with. It’s a bright sounding mic by nature on-axis but this “sheen” is easy to tame if a different tone is required on the frontend by positioning the mic slightly off-axis. The AKG C414, isn’t the only mic around that can be a single multipurpose mic but I’ve just found the C414 easier to work with compared to other mics of this type. However, I’ve switched to a new microphone over the last six months… more specifically a new microphone technology. Since November 2018 I’ve been using the Townsend Sphere L22 microphone in place of my beloved and trusted AKG C414, not because the Sphere is a more expensive mic or because it’s a new “studio toy”. Its because Sphere L22 provides me with more tonal possibilities both at the tracking stage and in the mixing stage. More Than Just One Microphone: The Townsend plug-in features a vast selection of vintage and modern microphone profiles. While this is great for microphone enthusiasts I personally don’t care how close each of the emulations are in sound to the original physical microphones, I’m only interested in having a selection of different sounds and characters. For me, each of the microphone profiles could be anonymously numbered without any fancy graphics alluding to what microphone they are based upon. When I’m placing the Sphere at a source to record I quickly scroll through each of the mic models until I hear a tone that I feel is fitting for the application and get on with the job of tracking. Before the Sphere I had a couple of options with the AKG, bright on-axis or slightly darker off-axis. The Townsend systems can give me a darker on-axis sound if I select of the the ribbons, or I can dial in an off-axis position after the fact in the plug-in. “Post” Polar Pattern “Safety Net”: On traditional microphones, such as the AKG C414, the first crucial commitment we make in tracking (other than microphone choice and placement) is deciding on which polar pattern to use. To the experienced audio engineer this process is second nature, for the enthusiast this simple but integral decision can cause a small crisis of confidence. At first I didn’t see the point in this Sphere plug-in feature, changing the polar pattern after the fact? But over the months this amazing feature made possible by the design of the Sphere has proven to be an amazing safety net for me if I hadn’t chosen the most flattering polar pattern setting in an initial part of a tracking session. Stereo Recording In One Mic: Turn the Sphere 90° and by use of the 180° plug-in component the Townsend Lab mic provides a totally in-phase stereo recording setup all within one microphone. This stereo capability doesn’t sound great on every application. I find it’s got an XY kind of feel to it which is great for most applications but from my experiences this feature sounds at its best on acoustic guitars. I consider it to be a tight stereo sound but this can be augmented in the plug-in to sound wider. For many years my go to channel strip microphone pre was the mighty Focusrite 428 MkII preamp. It’s sonic characteristics are clean, transparent and open sounding. Couple this preamp with an AKG C414 and you know exactly where you stand in terms of tonality and character at the mic end of tracking. It’s a simple plug-and-play preamp with a basic high pass filter on each channel for committing some low end tone cut at the front-end but again, like my microphone of choice, I’ve switched my channel strip from my 428 MkII to an different unit that I now consider to be one of my studio gear essentials. The Tegeler Audio VTRC is my workhorse preamp these days. I want to say it’s a totally different animal to the 428 but it’s not, it’s a totally different zoo in comparison. 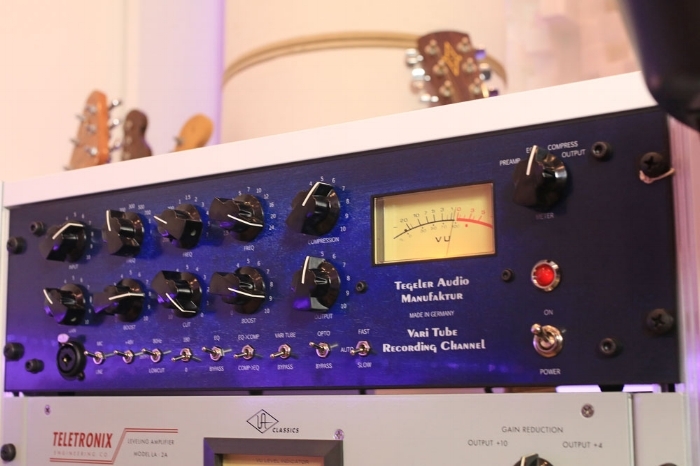 The VTRC is a tube based preamp featuring three bands of EQ, an opto compressor for gentle tracking squish and an input drive that adds a beautiful touch of saturation. I find the VTRC a breeze to set, the only limiting factor is my imagination so creativity and confidence in one’s recording abilities are a must to get the most out of this preamp. I’ve always described my studio as a control/live room as I track and mix within the same space. In my tracking workflows I demand a good set of headphones that can enable me to hear a good tonal balance in my headphone mixes at all times. My essential studio headphones are the KRK 8400, not considered to be best in class by any stretch of the imagination but I find these are super affordable, isolate foldback mixes extremely well, minimising bleed down the mic and are, to my ears, well balanced tonally. Did I mention these are designed to take years of punishment? For the money I don’t believe that you won’t find a more durable set of headphones. I own five sets of KRK 8400, hopefully that gives you an good idea just how much I depend on these as studio headphones. For many years I didn’t believe it was worth spending top dollar on heavy duty microphone stands as the humble mic stand only has one simple purpose… to hold a mic. How wrong was I? Mic stands were one of those items I would find at the cheapest price and chuck in on the back of another order as an after though because, in my hands, they never last that long. Trust: I can wholeheartedly trust that whatever microphone I attach at any height or angle will not move, slip or wobble during a tracking session. Ease Of Use: I can easily reposition the microphone without having to pickup the stand. The wheels make moving the microphone around an instrument or vocalist a doddle. Multipurpose: This particular microphone stand along with a camera adaptor also doubles as a very useful and solid video camera stand and jib. Read our article in which we talk more about this particular stand in more detail: What Is Your Typical Budget When Buying Microphone Stands? Is It Enough To Ensure Stability & Durability In Demanding Recording Sessions? My tastes in audio interfaces are simple. I don’t care for bells and whistles that much. Audio interfaces that I find inspire me to work hard in tracking sessions are often the most simplest ones to use. My main rig in my studio is a Pro Tools HDX 1 system with two Avid HD I/O convertors as my “audio interface”. Though this rig gets used most of the time I do like using other smaller interfaces for less demanding tracking applications. The Focusrite Scarlett second generation 6i6 is my second tracking interfaces and I also use an old Digi 003 as well. As I said, simplicity is key for me in tracking sessions. All I want in an audio interface is power on/off, straightforward approaches to getting sound in & out of a DAW and basic monitoring & headphone capabilities. Anything more in terms of features are wasted on me. Audio interfaces that look complicated and fiddly don’t inspire me to use them in demanding creative tracking scenarios. If I wasn’t using a Pro Tools HDX rig I would have a Focusrite Clarett interface instead. These are amazing sounding devices which provide just the essence of an audio interface and that’s what I prefer, a nonsense recording solution at an affordable price. Tracking sessions generally move at quite a pace when I’m in the producer’s chair. Control surfaces help me to keep an absolute handle on tracking by enabling me to quickly adjust track levels, headphone send levels as well as manage a session’s important info such as track names and panning positions. When a control surface isn’t in reach and I’m relying only on a mouse and keyboard I find my tracking sessions take longer as I can only perform one operation or function at a time. With a control surface I can adjust more than one fader level in a single hand movement while my other hand is working the transport. I currently use an Avid C24 in my main studio and a Digi 003 in my second system in the house. These are both legacy desks now, although the C24 is still listed on the Avid web site as a current product even though on the Avid website End Of Life lis, its Final Sale Date is listed as 32st December 2017! if I were to get a control surface now then at the very least my tracking workflow would require an 8 or 16 fader unit. Presonus’ Faderport range would be at the top of my list of control surfaces to consider. What Are Your Studio Gear Essentials For Recording? To summarise: The studio gear essentials I need in my current recording workflow consists of a single multipurpose microphone that I can use for a variety of recording applications, a character channel strip mic pre with EQ & compression, decent studio headphones that don’t break the bank and are durable, a heavy duty microphone stand, a nonsense audio interface for straightforward tracking and a control surface to enable me to maintain a good pace of work when recording. Only 1 in 5 Of Those Recording And Mixing Audio Bother With High Sample Rates - Are You One Of The Few Who Cares?